You can forgive yourself if you choose to ignore this. Lots of people ignore me when I talk about this. It's okay. I'm used to it. However, that's not going to stop me from saying it again (and I've said it many times before): one of the most essential possessions you need as a photographer —one of the most-needed accessories, both for editing and for printing—is a viewing station. Used to be true in the darkroom, and it's still true in your workspace. You can buy one of these if you want—if you have a lot of space, and a lot of money (note the price!). We had something like this where I used to work, and it was nice. Although things like this always seem to be around the corner or down the hall, and that's not where you need a viewing station to be—you want it to be right there, easily viewable from wherever you spend a lot of time. It should be easy for you to look at your pictures. My viewing station is right next to my desk. I need to turn my head ninety degrees to the right. I admit, that's just where it happened to fit (TOP World Headquarters being a tad, um, cramped), but it works. Like all my possessions, my own viewing station is ultra-deluxe, customized, super-duper, and whoa expensive. Okay, no it isn't. It's cheap, small, and basic. It consists of a $27.99 cork board from Office Max (I really should have bought the bigger one) and a $79.95 Verilux Original Natural Spectrum Deluxe Clamp Lamp . But actually, this is fancier than a viewing station has to be. Mark Power used to recommend a sheet of 4x8' homosote nailed to the wall and painted. Whenever it gets too many pinholes in it, just paint it again—the pinholes fill in with paint. Cost, maybe $8. Plus paint. I've had plenty of viewing stations with no special kind of lighting—windowlight works nicely if you've got enough—but the days in Wisconsin seem to be about five hours long this time of year and the light in my office at night is dim and yellow, and I'm doing more color now. At one school where I worked I'd just wander around with the tray with my print it in. I'd look at it under all sorts of light—in classrooms, in colleagues' offices, in the stairwell. Everyone thought I was eccentric. 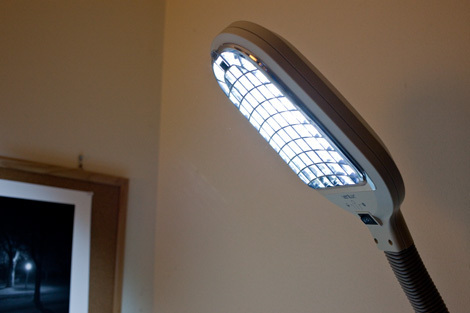 The best viewing light I ever had, at a school where I taught (long ago and far away) had both a fluorescent tube and an incandescent bulb. I'm sure it wouldn't have measured very well, but it told me what I needed to know. I just got the Verilux. I like it pretty well. The color seems good, although I have no way to measure it. It's not terribly bright, which actually suits me fine—about three to four feet away puts the right amount of light on the prints, and that's about where I had a handy place to clamp the lamp's clamp. There can be problems using a 100% fluorescent light source to view pictures with. Mainly, fluorescents can excite brighteners in papers that have them, making them look too bright or giving them a color cast, usually (but not always) bluish. I don't like papers with brightening agents added, so a fluorescent light is a plus for me—if the light makes the paper look wonky, I stop using that paper. After years of evaluating brighteners in darkroom papers, I don't trust any paper with brighteners in it. The Verilux clamp lamp comes in two colors: "ivory" (off white plastic) or "graphite" (dark gray plastic). The clampy part evidently used to be plastic but is now made of metal. The bulb is supposed to have a life of 10,000 hours, so you probably don't need to buy an extra one. It's amazing how much you learn about your pictures from looking at them. And presumably you find it enjoyable, too. Maybe I'm narcissistic, but I enjoy admiring my creations. A viewing station of some sort, deluxe or basic, expensive or cheap, carefully designed or seat-o'-the-pants, is far more important than another lens, a new printer, a bigger card or newer software, or another camera bag or flash unit. There, that was easy—and now you don't have to worry about me writing anything about this for another year or so. P.S. I forgot to mention that two further advantages of the Verilux lamp—and note that I am not claiming that it is the best possible lighting option—is that it is flicker-free and, importantly for me, noise-free...that is, it doesn't buzz. Please bookmark our links pages! "Solux—worth a read, even if you don't "buy into" it. "Then there are scores of 5000K fluorescents, such as from Philips, Sylvania, and Westinghouse. [Note that the Philips Colortone 50, GE Chroma 50, and Sylvania Design 50 may be the same bulb. Note too that Philips seems not to be using the name "Colortone" any more—the new "Alto" tubes come in "Natural Daylight" (5000K) —Ed.] These need replacement every few years if you'd like consistency in your lighting. In theory the higher the CRI [Color Rendering Index —Ed.] the better. "It's best not to have too hard focused a light (i.e. use a diffuse source or multiple narrow beams) because our eyes are easily fooled. 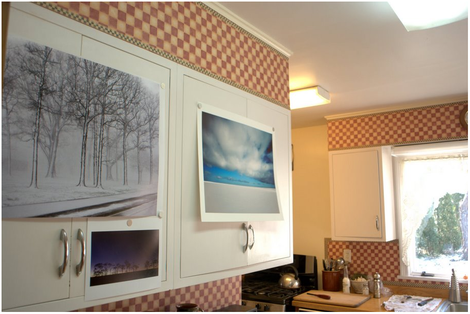 Ditto for avoiding too bright or too dim a light (which will result in darker- or lighter-than-usual prints). Avoiding glare, hot spots or uneven intensity across the surface of large prints or multiple smaller ones can be challenging. "Ideally the color temp and intensity of the viewing light should be matched to the monitor—even if both are not in the same field of view. "If you are testing new inks or processes for metamerism, it's essential to also view prints in daylight (and compare to fluorescent and tungsten of different flavors). "And finally—I am sure this is an old trick—to weed out papers with OBAs (UV brightners) it's easiest to use a black light. "So, there's my check list...."
Mike adds: I'm of two minds about the gallery-lighting trick. I measured a number of galleries in Washington. D.C. the 1980s and found that there is no resemblance of a standard—different galleries and museums have wildly different types and intensities of lighting, so keying your home setup to just one gallery might end up being misleading. Secondly, I found that for my tastes, gallery lighting is too bright for the home, where ambient light levels are generally quite low at night, and certainly too bright for the darkroom. I tend to use a strong light but one that is somewhat lower in intensity than gallery levels. Black light is indeed useful for detecting OBAs (optical brightening agents). I once did a test where I washed a number of black-and-white photo papers for one, two, four, and eight hours, looking at them under black light at the end of those intervals. Some of the papers were positively garish under the black light—after two hours, one print had bright streaks across it because the OBAs were half gone! My response was to relentlessly minimize the wet times of black-and-white papers during processing. Ilford now claims that the OBAs it uses do not wash out of its fiber papers under long lead times, but I simply prefer papers that don't have OBAs in them at all—and that goes for inkjet papers too. No good can come of brightening agents, he said darkly. Featured Comment by Tom: "Another vote for Solux (if you can afford it). I saw the Solux-illuminated Pete Turner exhibit at the Eastman House in Rochester and it was certainly the most impressive display I'd ever seen. Turner's prints with their striking use of color, framed in white, illuminated with spot lighting and hung on a mat black wall. The prints looked more like transparencies on a light table. You can get an idea of the effect at the Solux site. Note how well the daylight fluorescent light matches the daylight through the window; the fluorescents around the corner from the prints are standard "kitchen and bath." I can also introduce tungsten from lights not seen. So, after an evening of printing, the first thing I see on my way to the coffee pot is my previous night's work with any lighting source I want. For anyone who wants to use magnets, but is without a handy metal wall, there is magnetic paint available which would allow the use of magnets on any wall painted with same; I haven't tried it yet. P.S. Mike, I used one your favorite lenses for one of the shots: a 50mm SMC Takumar ƒ/1.4. Featured Comment by Mike [not Mike J. ]: "Great post, as proper viewing conditions has been something I've fought with for 25 years, from (as you mentioned) the darkroom to the computer desk. "The daylight balanced booths are a standard in the printing industry so that everyone, from the photographer to the graphic artist to the guy running the RIP to the printer can all (supposedly) have a standard light source for viewing the various stages of the project. So if you're in that industry, then great. "I also figured that it would be better to view by tungsten, since that's what's in most homes. However, I ran around my 80-year-old house with a light meter and discovered that, during the day, boatloads of sunlight are coming in and illuminating the stuff on my walls, even indirectly. So it's hard to establish a standard for seeing what others will see. "All that said, I use an Ott Lite next to my desk, and occasionally walk around with prints into other rooms. But the most important (to me) part of having a controlled light source for viewing is to see if my prints match my monitor, and if my inkjet prints match lab prints, because I do both. You really want that viewing source to be the same day after day for consistency. For those of us with home viewing stations, keeping a steady light level is a pain. "By the way, there are standards for museum lighting, but it depends on what they're displaying. Temporary exhibits of modern photography will be illuminated more brightly than exhibits of old work, or paintings, or especially textiles. You can look up those museum illumination levels if you like, but I guarantee they're much dimmer than in the home. The reason they may 'look bright' in a museum is because the rest of the room is lit even more dimly." If you took a photo illuminated only by your Verilux of a white piece of paper with a digital camera set for daylight balanced exposure (5500K), imported the photo into Photoshop or other like editing program, opened the file, corrected it for white/gray balance with the eyedropper tool, the program would then set the color balance of the paper to white/gray. Now read the K temp showing and it should tell you by how many degrees K your daylight balanced light is off? If it reads 5500K, the Verilux is dead on. If it reads higher or lower due to your correction, then that should show how much off daylight (or 5500K anyway) the lamp is. I think? You should write on this often, though labeling it as "VIEWING STATION" may be off putting to some. I always have my latest "affixed' somewhere for viewing, though not always under the best light. But, if someone other than me acquires one of the pieces, I have no control over the lighting. A "natural' form of "censorship"; the acquireee has control. I've used a florescent and incandescent combo for many years; it feels right, and when there is some light from the north window, here in the balmy part of NW Indianer, all the better. Thanks Mike! I need this (note to kids its on my Amazon wish list). I bet it will work in my RV if I ever get a printer for the darn thing. Neat B&W, from what I can tell. Reminds me of a Brassai photo in some old park in Paris. When I took a color managment course in 2003 with Andrew Rodney, I learned of the importance of a viewing station. Santa Fe Workshops had one of those nice professional ones, I think it was made by Gretag MacBeth, perhaps. I haven't ponied up the money for one of those (yet), but I certainly agree with the importance of having *something*. Right now, I use what is purported to be a daylight-balanced fluourescent light in combination with an overhead incandescent bulb. I view my prints on my dining table this way, the dining table also serving as the surface for using the mat cutter (if you think you have a small place, Mike, I can guarantee mine is smaller). This works surprisingly well, much like the situation at the school where you used to teach. Like you, I find the combination of the two seems to correct to the deficiencies of each source independently. At some point, I may get the light you have, or better yet, a lamp with a Solex bulb. MIke, I really like your set-up with the corkboard. Looks like a trip to the local crafts store is in order (or at least, an office supply store). BTW, the light I was referring to is made by OTTLite. Ottlite makes a large range of daylight-balanced fluorescent lighting, some of them look really good. 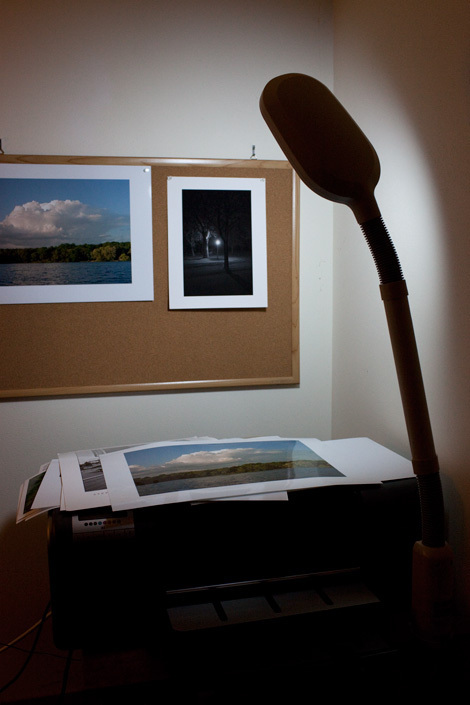 The Vero Desk lamp I am using has a narrow bulb, a broader bulb would be better with respect to viewing prints. I'm thinking I could find another one on their website that would be even better for viewing prints than the one I presently have. Looks like a trip to the Ottlite site is in order as well as the craft store. I hadn't realised you used a B9180, I have the same printer and love it. They've been known to have some 'quirks' but I've had zero issues with mine. Back on topic, I've been wondering about a viewing station myself, though it will definately be along the lines of yours, i.e. a lamp bolted to the desk. Well, I'll out-cheap you on the light: get a clamp light (from your hardware store) and a 5100k compact fluorescent bulb. These days, you can get a full spectrum compact fluorescent pretty cheaply online or even at some Home Depot's. A heck of a lot cheaper than the clamp lamp. My mother got a floor-standing version of that lamp for reading, and when I saw it on a visit once I raved about it enough that she got me one for my birthday. She was happy about it, too, since it was the first time in years that she knew what to get me. I don't have an extra bulb, but it hasn't been a problem yet, after four years. I do have to let it warm up for about fifteen minutes before the color is quite right. Great advice, Mike, but may I suggest the use of those cute little magnets you can get from stationers now and a metal "whiteboard"? No damage to prints, and it helps overcome the inertia factor that pins induce (you know, you say to yourself "Oh, it might as well stay there for now" ... for about a year). Also, experimenting with sequencing prints (e.g. for a book) using small 4x6 versions (or smaller) is easier and a lot more fun. The whiteboard doesn't have to be white, of course -- those little magnets are amazingly powerful and work through many layers of paper -- you can easily experiment with different background colours -- just magnet on a new sheet. I love them! Like you, I have my own little gallery going on the wall next to my PC. Just because the bulb has a color temperature of 5100K doesn't mean it's a good viewing light. It also needs to have a high CRI (Color Rendering Index), 90 or better. If the bulb specs don't give a CRI, you can assume it's lousy. What happens with a poor CRI is that, while the overall color balance may be roughly correct, individual colors will appear wrong. As for me, since most people buying my work are displaying it in a home environment, I balance for indoor lighting, not 5000K. This used to be easy-- aim for 3000K and you'd be in pretty good shape. These days home lighting is nowhere that predictable, but I still use 3000K for my viewing area. My viewing staionis currently our stairwell. It's painted with a (true) white paint and lit by 3 11 watt 4000k cfls in an uplighter. I have been very pleasantly surprised by how well the environment works for enjoying and assessing both colour and black white prints. I keep my latest prints magnetized to the steel door of my apartment. It's a bit far away for normal viewing, but I can ponder prints over my morning coffee, watching how they change as sunlight pours in through the big south facing window. All household/interior lighting will change in the next 20 years from incandescent/fluorescent to LED/colored LED. This brings a new level of obfuscation to the already complicated topic of color. You almost motivated me to make a viewing station the last time you wrote about it. This time I think you convinced me to push away from the computer for a while and do it. Prints, not images on a monitor, are still the end game for me, so I really need this. Thanks for another kick in the pants to get moving on this. I would post a picture of my primary viewing station, but I haven't made the bed yet. I use an Ottlite like some others at the desk and I too have a wall space just to the right of my desk. but since I live in a tiny cottage, its all in the bedroom. So the first place for viewing is the drying rack (the bed). Lovely North window and East window. Then sometimes the kitchen table North and West windows. Glad to see that some of us still print. Great information all around. This is an issue that hit home early on for me, when I started printing on Epson's first 'archival' pigment ink printer, the late unlamented 2000P. This produced prints with apparently decent color balance under incandescent lighting using the Epson's canned profiles, but they turned a ghastly green when you carried them over to a window. This spectacular metameric failure has been reduced with each generation of inkjets, and current models are really quite good in this respect. But even gelatin silver prints won't look the same under 2000°K incandescent lights and 7800°K reflected blue sky. Some kind of standardized viewing at least lets you judge whether your prints are going where you want them to. This problem is magnified when you start printing big. My wife, God bless 'er, made me some a cheap 'n cheerful viewing station by hanging some rubber-shod clamps on nails in the wall. This lets me hang prints up to 24x36", and I subject them to incandescent, flourescent and (weather permitting) window light to see what happens to the color. I sometimes make 24x80" panoramic prints. I have just enough floor space to lay them out, but part of the print is lit by window light and part by ceiling incandescent bulbs, so I can't know what they'll really look like until they're mounted and hung. Subscale test prints don't work, because color and tonal perception changes with scale. The best I can do is make test prints of small sections and trust my color management is adequately dialed in. There are standards for print viewing, but the only firm ones I'm aware of apply to the graphic arts industry. Even fine art museums cannot seem to agree on viewing standards for photographs. From my own experience, your school practise of wandering around looking at prints in various real-world light conditions makes a lot of sense. Though a print might be displayed in a variety of situations, I find that the likely situations fall within a range that's achievable by a single expression in printing. I think that a print viewing station should reference that range of real-world display rather than any arbitrary standard. This can be done inexpensively, but I do think it's important to do lots of wandering around with print in hand just to make sure that the illumination of the viewing station makes sense. And yet you EDIT in this light? Maybe you've improved it since that picture was taken? The light on your editing station is at least as important as your viewing station. This was a couple of years ago, but I found a variety of work lamps and daylight bulbs at Pearl Paint, an art supply chain. They sell a task lamp that holds a fluorescent ring and an incandescent bulb, each with its own switch (I bought a much cheaper one that came with a single "full-spectrum" compact fluorescent). I just put high-CRI bulbs into the overhead flyorescent fixture in my office; so there's a LOT of light, as well as decent color balance. Go for 4'x8' homosote for a viewing station if you can squeeze out the space. It's worthwhile having enough viewing space so that you can leave pictures up for a month or two if you need to have time to make up your mind about them. If I leave images up long enough I can always make a pretty decisive choice about whether they are keepers - and I know why I made the decision too. But sometimes it takes a month or so to really know why I'm making a choice. Living with your images will do more to improve your photography than you can imagine. You aren't learning about your images when they are in a box. Also Ott Lites rock. But get the ones with 18 watt bulbs. The 13 Watt Ott Lite bulbs are a little too dim for good viewing IMHO. Years back when I was working with a group of consumer magazines I made the production director buy a specific viewing station so that our people were looking at proofs under the same lights that the printer was using. Seemed logical to me. One day I was coming back from an outside appointment and ran into one of our publishers standing in a large newsstand (in NYC's Pan Am building, across the street from our offices), looking at several cover proofs for one of the magazines. When I asked why she was doing that and not using the setup in the office, she said that the buyer will see it on a newsstand, not under those lights/conditions. I use an Ott Lite to look at my prints as I am making them, but always wonder what they will look like later, when someone else is viewing them under different conditions. We shouldn't ignore you, at least not on this important topic :-). Many photographers go on and on about monitor luminance ("must be no lower than 90 cd/m2, no higher than 120 cd/m2", etc), but all of this assumes something about ambient light in the monitor work area, and equally important, a certain amount of extra illumination on the prints if one actually is striving for monitor-to-print matching. Intuitively, it seems to me that the higher the illumination on the print, the higher illumination one can aim for on the monitor, albeit with some adjustment to monitor surround illumination. In other words, the whole round trip from monitor to print viewing requires some basis for standardization that rarely gets discussed in entirety. Professional profiling packages must assume some underlying relationship to compute LAB values on monitor and LAB values in print, but I've never seen it explicitly defined. There must be a standard on it somewhere. I'm wondering if any of T.O.P. 's very knowledgeable audience has an opinion on print illumination levels when trying to establish good monitor-to-print (soft proofing) conditions. I do know the industry seems to have settled on 2000 Lux viewing booths, and minimum values of 500 lux for color matching related tasks. I find I need two Solux 50 watt lamps at just a few feet away to get to the 500 lux level with reasonable uniformity over a 20x24" print area. Home Depot sells 48" Phillips Colortone 50 (5000K, 93 CRI full spectrum lamps) for about $8.00 apiece to fit in standard fluorescent shop light fixtures (very inexpensive as well). This approach is a good close second to the Solux lamps in terms of color spectrum, and superior in achieving 500 lux uniform illumination. Its also a great way to illuminate large work surfaces in one's studio. Great post here Michael - I actually don't have a viewing station. In defense of that, it's partly because we just moved into our house a month ago and I have yet to unpack and get my 13x19 printer set back up. Although that argument falls apart since I didn't have a viewing station at the house in SC either. I had thought about setting one up, but like yourself, am kind of at a premium for space. This has motivated me to get things set back up though and get back to printing my pictures! The only suggestion I would make is to use a thin sheet of galvanized steel rather than the cork-board. Nail that thing to the wall and use magnets rather than push pins. The slick thing is that if you can then paint the steel any color from the Pantone color range. I've used this setup for a great many years and it fits in with my more modern aesthetic than cork-board. Some profiling packages will take ambient illumination into account when setting the optimum brightness level for your monitor. Others won't. In the latter case, your monitor brightness will probably be fixed by the profiling system, which means you have to adapt your viewing area brightness to correspond, if you're trying to produce a close match between print and screen. That's what I did when I built my web site, BCM (Before Color Management)-- I matched the conditions, so the white on the monitor had the same brightness as the white in the print I was using as a reference. It worked very well! That assumes your goal is to match a monitor to a print. If your goal is to make prints that look most correct to the audience, you need your viewing area to closely match the final viewing conditions, and if the monitor doesn't agree, that's life. In that same vein, I run my monitors at D50, *NOT* D65. 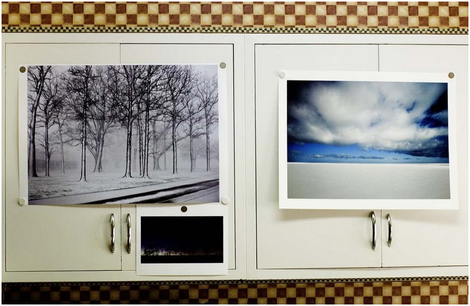 D65 is an industry graphic arts standard, but you'll hardly ever display art prints under D65. D50 is a good match to sunlight, and normal indoor viewing under incandescent light is only 3000K. I get a much better match between screen and viewed-print color keeping the screen at D50 than at D65. It's going to get worse for a while. Then it'll get better again. I agree that the next 5-10 years are going to be a real pain for artists like me. (Insignificant price to pay for energy efficiency/CO2 reduction, so I ain't complaining, just commenting.) Indoor color balances and CRI's will be all over the map. Figure that anyone who isn't viewing the work in a well-lit environmnt probably doesn't have as fussy an eye as you, and go with the flow. After that, it'll get better again. NIST is developing a new color rendition standard for solid-state lights that'll work much better than CRI and will likely be closely matched by most manufacturers. Sometime circa 2015-2020, it'll all settle down again. Meanwhile, look on the bright side, we can be a little LESS obsessive about our viewing spaces. Having a good light for viewing prints -is- important. But, frankly, consistency is more important. I'm not sure I've ever seen photo prints displayed as clinically as fetishism for post-production viewing stations would suggest. The key consideration for museum displays, I know, is preservation. That is, lighting levels are very subdued and are nearly always tungsten. 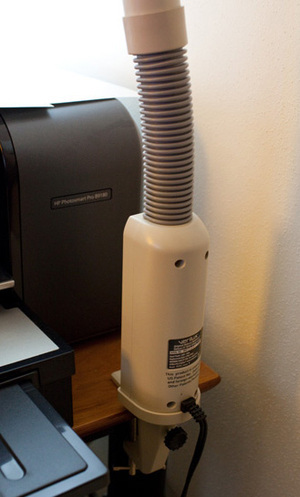 Personally, I use this Daylight® lamp at my print station to evaluate prints: http://us.daylightcompany.com/art/product/?id=249 (It has a CRI of 85, a color temperature of 6500K, and produces 1900 lumens.) The magnifying lens can sometimes be handy, too, although not daily. Great topic; thanks for starting a wonderful conversation, too. I've thought way too little about lighting, but have been motivated to do so. I modeled my viewing station after the Photographic Society of America's "Uniform Practice - Judging Practices" and it works well for me. Take a look at 'http://www.psa-photo.org' on the Competition tab. I did drop the intensity of the light a stop or so, to match the level I measured in the office building where I work. Good post Mike. Balanced viewing is a vital component of any imaging system. I'll second the Solux desk lamp solution, or even the track and 12 volt heads for a larger installation. These are reasonably priced and they are the best spectral balance of any available. Any florescent bulb's spectral energy response is very spikey compared to a Solux halogen, and the overall CRI is rarely as good. In addition you can get the Solux bulbs in a variety of color temps. Don't confuse the need for a high CRI with the color temp. Museums and galleries in the DC area are typically using 3500º Kelvin halogens, so if that is your destination use 95 CRI/3500ºK bulbs and calibrate your monitor accordingly. If your market is publishing use 95 CRI/5000ºK bulbs and calibrate to the same temp. We can influence a gallerie's choice of illumination, particularly if they are using 12 volt halogens, because they can simply replace with Solux bulbs as their existing bulbs burn out. The cost is reasonable at about $8 each. The Verilux bulbs range from 85 CRI/6500ºK for the compact florescents to 94.5 CRI/6280ºK for most of their fluorescent tubes (info from Verilux). Certainly much better than nothing, but in my opinion not as good a solution as Solux. I am with Ctein. I have never understood the advice to use a ~5000K bulb to evaluate prints since virtually no one uses such lighting in the house, office or the gallery. I look at mine under halogen track bulbs that are down in the ~3500K range which seems to be a good compromise for all the lighting in my home and every gallery I have visited here in Portland. They all seem to use the Home Depot brand of halogen tracks. I have yet see anyone using ~5000K lighting anywhere. I have found with the stock Epson profiles that a pretty high amount of light on the print results in a near-perfect match to the screen. As a result, there is a perception that the Epsons "print dark" -- which they do under "normal" room lighting. I'm reminded here of practice in music production: engineers listen on monitor speakers, which are designed to be musically neutral, in order to understand what's in the mix. Often they'll also run the same mix through lousy boombox speakers or other low-fi equipment, so that they can also understand what happens when the music makes its way out into the world.